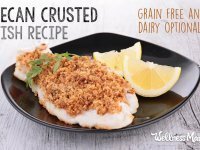 A delicious pecan and walnut crusted fish. Serve with a fresh salad and/or roasted brussels sprouts on the side to complete this healthy meal. Preheat oven to 400°F and make sure fish is defrosted if using frozen. In a bowl, whisk eggs until smooth in a bowl. Put ground nuts on a large plate. Dredge each piece of fish in egg and then dip in the ground nuts. Nut mixture will not stick as well as flour and this is ok. You should have some leftover nut meal after lightly coating the fish. Carefully place each piece in a large baking dish. After all fish is in dish, top with any remaining ground nuts and pat down. Pour melted butter or ghee over fillets. Put fish into preheated oven and bake 15-20 minutes or until cooked through and starting to flake. While cooking, prepare salad by washing spinach and lettuce and topping with desired toppings: pumpkin seeds, nuts, feta cheese, olive oil, and homemade dressing of choice. Can't do eggs? I've had success with these egg alternatives.